Cleveland is a spooky place, and not just around Halloween. 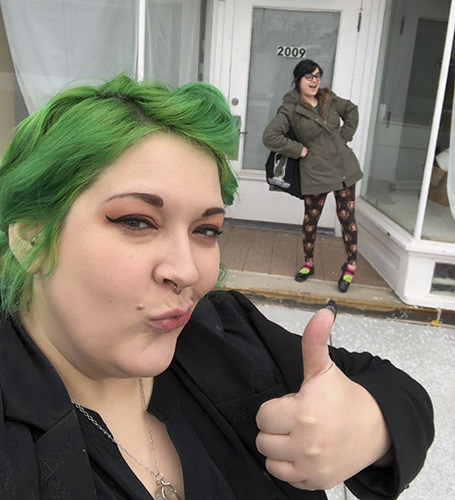 No one knows that better than Jessica Oktober and Marleigh McVeigh, co-founders of the Cleveland Area Paranormal Society (CAPS).Together the two lead a team of experts in serving up everything paranormal—from Haunted History Tours around Cleveland to cryptid crafts to tarot card and tea readings. 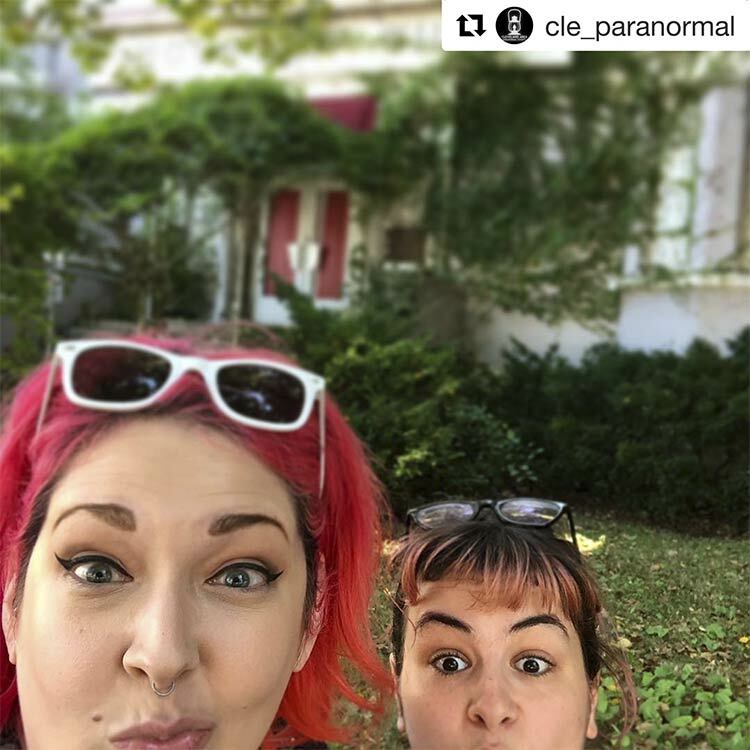 Jessica Oktober and Marleigh McVeigh, co-founders of the Cleveland Area Paranormal SocietyFounded in June 2018 with a sold-out haunted tour of downtown Cleveland and the goal of focusing on blending the city’s history and folklore in an educational and entertaining format, CAPS has developed a devout following. They have more than 5,000 Facebook members who track McVeigh’s and Oktober’s knowledge not just of the paranormal, but of Cleveland history, the city’s burlesque scene, and their love for all things eerie. “Jessica and I have been studying this stuff for a really long time, and we’re all about getting out into the community,” says McVeigh, who first got into paranormal phenomena around the age of 15. Before deciding to make the paranormal her life study, she studied anthropology and psychology in business school. Jokes McVeigh, “I always tell my friends that I decided to do this instead of going to college." Oktober, an accomplished photographer, first got into witchcraft around the age of 12, and her interest in the paranormal has never waned. Both McVeigh and Oktober have a background in retail and business experience. This Saturday, February 2, McVeigh (aka the "Captivating Clairvoyant of Cleveland”) and Oktober (aka the "Purveyor of the Paranormal”) will open CAPS Shop alongside Jonathan LeStat, director of strategy. The shop is located at the intersection of Carabel Avenue and Madison Avenue in Lakewood. 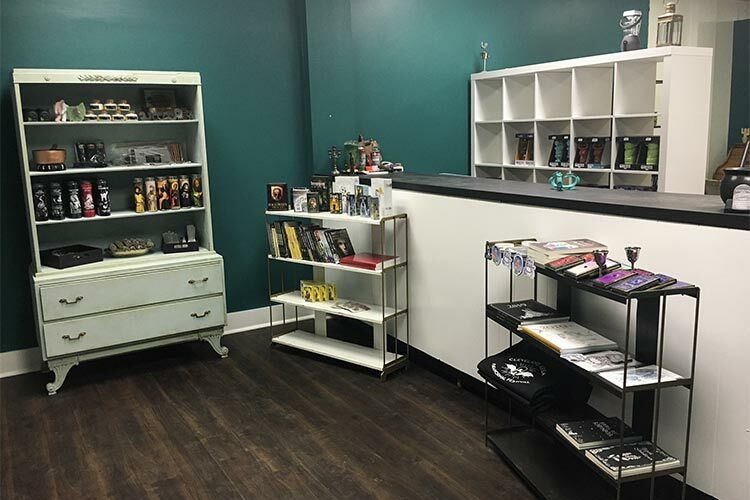 The 600-square-foot store—nestled between Black Sheep 216, the Lash and Beauty Boutique, and The New Moon witchcraft shop on the corner—sells an array of paranormal books, tarot and oracle cards, candles, crystals, and even ghost-hunting equipment. The space will also serve as CAPS headquarters and event ticket office.“We’re taking over this humble corner of Lakewood and making it spooky,” says McVeigh. Cleveland Area Paranormal Society Shop, 2009 Carabel Ave in LakewoodThe store also makes a perfect space to host CAPS’ regular workshops and classes that cover a wide array of paranormal topics including conspiracy theories, cryptids, tarot, paranormal investigation, as well as spooky arts and crafts. For October, an added benefit is that she believes the building may be haunted. “It’s old and weird, and awesome,” she proudly says, relating an experience from one night when she was working in the store, and all 15 lights one-by-one went out. Then they went back on. Oktober says the back area of the shop will serve as the CAPS offices and employee break area, while the front of the store, decorated with vintage furniture Oktober has collected, will display the retail goods. Upcoming CAPS events include a lecture on Conspiracy Theories and the Occult on Friday, February 3; a Paranormal Boudoir Photo Shoot with Oktober’s photography company, Lumos Photography, running Friday, February 4 through Saturday, February 9; a workshop on Tarot for Paranormal Investigation on Saturday, February 9, Wednesday, February 13, and Sunday, February 17; and a Haunted History Tour of Riverside Cemetery in Brooklyn, starting on Friday, February 15 and running on weekends through Sunday, March 10. The Riverside Cemetery tour will include history on Hannes and Louise Tiedemann—owners of the reportedly haunted 1881 Tiedemann House (aka "Franklin Castle," at 4308 Franklin Ave., and Cleveland’s west side equivalent to Millionaires Row on Euclid Avenue). Hannes Tiedemann was a wholesale grocer and founder of the Savings & Trust Co.—one of the first trust companies in Ohio. Additionally, CAPS is working with Playhouse Square on some Haunted History Tours of the Connor Palace Theatre. “It’s so haunted, it’s ridiculous,” says Oktober. The group plans to also present a murder mystery, written by McVeigh. The CAPS grand opening is from 1 to 9 p.m. on Saturday, February 2. The event will include free tarot card and tea leaf readings, spooky food and drink, and music by DJ [Jonathan] LeStat. Guest can receive 15 percent off merchandise if they sign up for CAPS’ newsletter. The store is normally open from 12 to 8 p.m. Wednesday through Saturday; 12 to 6 p.m. Sundays and Tuesdays. The store is closed on Mondays.